Flow Yoga? Vinyasa Yoga? Vinyasa Flow Yoga? Yoga has been around for thousands of years. There are so many translations of the documents that talk about yoga that there doesn’t seem to be a definitive way to do things. The poses all seem to have different names, and when you hear a name you’ve heard before it can be done entirely different from what you were taught. Pronunciation is all over the board. There just doesn’t seem to be any way to know what you are getting . . . exactly. I have been taking a few different classes to check things out. And this is what I have come across. There is “Flow Yoga”. That is where the class is done in a flowing manner. The participants move from pose to pose using the breath. There might be poses where we stop and stay in it for a few breaths, but basically we are flowing from pose to pose. Then there is the Vinyasa style. Now Vinyasa is a flowing class. It might not be called “Vinyasa Flow”, but that is usually what it is. With a Vinyasa class participants flow from pose to pose and they are done on the breath. There might be some stopping and holding, then flow to the next pose . . . but there is also “a Vinyasa”. You can look it up and you’ll see vinyasa is defined as “arranging something in a special way.” That can be applied to the class as already mentioned, but it can also be applied to a small sequence of poses. In a Vinayasa class, in addition to flowing from one pose to the next, you “take a” or you “do a” vinyasa which is a specific set of poses. It is generally the same, but it might be modified for the level of the class, but “a vinyasa” is typically plank pose, to knees-chest-chin or chaturanga dandasana, to cobra pose or upward facing dog pose, to downward facing dog pose. The less intense vinyasa would be the one with the knees-chest-chin and cobra pose, whereas the more intense version would include the chaturanga dandasana and upward facing dog pose. You could also do a combination and do knees-chest-chin with the upward facing dog or the chaturanga dandasana with the cobra pose. What you also might experience in a class is something that really can’t be defined. At some venues where they do yoga . . . like at an actual yoga studio . . . they might have classes that are separated into levels. So a level one flow class will be different, probably less intense than a level two or three. But at some places every class is expect to be an “all level” class . . . and that is where you will probably experience something that can’t be defined. In order to allow “all levels” to participate the instructor will modify and change what she can in order to make certain that everyone can participate. This, to me, is where a lot of the changes in yoga has come from. So the need to alter it so it is accessible to the general public in combination with the fact that the translations are so varied has resulted in no definitive way of things being done or described. So, my conclusion and definitions say: Vinyasa yoga is flow yoga, but flow yoga is not vinyasa flow. In Vinyasa yoga you do vinyasas. The BEST way to know what you are getting is to talk to the instructor and/or take a class. It helps to see for yourself. You can always tell the teacher that you are taking the class to see if it a fit for you, then do the best you can. If you like the class return to take it again. If you don’t like it, you can always let the instructor know it was not what you were looking for. When attending a class for the first time it is good to keep in mind that you might get a little different than you expected, but hopefully you will be able to enjoy the class for what it is. What kind of yoga classes do you like? Sometimes in Nia we do yoga poses, I have yet to do the sphinx in a Nia class, but I do include it in the Gentle Yoga class I am teaching. I think of it as a nice gently backbend. I think of it as a regal pose. I think of it as a spine lengthener and a back strengthener. I like the Sphinx Pose. Ha, I think I will stick with the idea of regal. The Sphinx Pose is another prone pose, where you are lying on your belly. Your legs are together, touching, and straight out behind your body. Start face down, with your arms stretched out on the ground above you, as if you are reaching above your head. Before bending back, gently press your pelvis towards the earth, lengthening your tailbone towards your feet. As you lift your head and chest up off the ground, bring your arms back. Stop when your elbows are directly underneath your shoulders. Or you can bring your hands up by your ears and gently push up into the backbend. Adjusting your hands so that your elbows are directly under your shoulders. You are resting on your elbows and forearms, palms down, fingers together. Continue to keep your legs together, while your toes are reaching toward the opposite wall/direction. Your back is active, while your arms are supportive. Reach with your chest somewhat upward and open. Your shoulders are back and your shoulder blades are pressing gently toward the earth. Your gaze is forward and your posture is regal. You are strong and confident. Breathe into the pose. Hands, arms, neck, back, and legs are all active yet not tightly clenched. Stay for a few breaths or as long as your practice dictates. Release and lower to the floor, allowing your head to turn to the side. Rest your head on your hands and repeat as desired. This is a nice gently backbend that can be the next backbend after learning the locust pose, if your practice is one in which you are progressing from a small backbend to a “bigger” backbend. 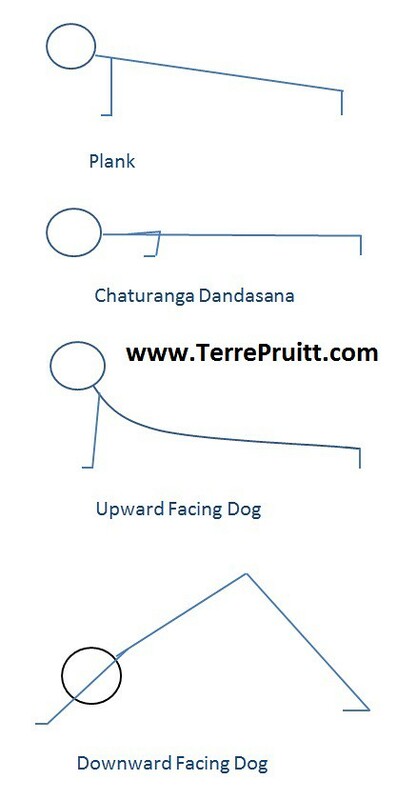 These (the Locust Post and the Sphinx Pose) can be preludes to the Cobra and the Upward Facing Dog. Of course, this is a great pose to practice even if you are already doing the other backbends. This pose is great to help strengthen the muscles in the back. If necessary a rolled towel can be placed under your pubic bone in the shape of a U to provide cushion. The U would be “hugging the belly”. Do you have backbends in your practice? Is sphinx one that you do? What backbends do you practice?